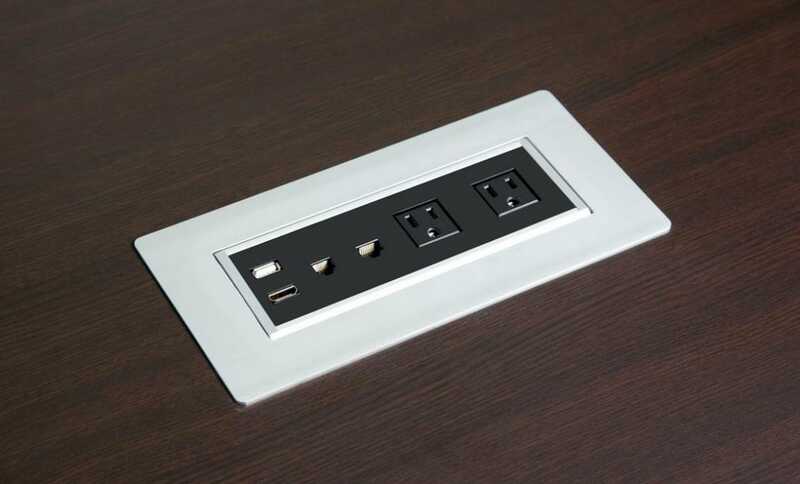 There are countless numbers of reasons why you might want power outlets and data ports installed into a conference table, fortunately the process is generally pretty easier whether you have an existing conference table or are buying a new conference table. If you are buying a new conference table the easiest way to get yourself with a powered conference table is to buy a Harmony Collection conference table paired with a PLT-B Power connectivity box. Harmony conference tables come with pre-cut cable grommets that can be replaced with the PLT-B Power module, all you do is pull out the grommet and replace it with the power module, couldn’t be easier! If you have an existing conference table that you want to add power it is likely that you’re going to have to make some modification to the table in order to get the connectivity box installed into your table. If you have pre-cut grommets, odds are they are not cut to the correct size but it will save you some drilling when it comes time to modify your table. So step one is going to be to pick out the best power outlet connectivity box for your circumstances. Chances are you may need some data or media connections paired with power outlets. There are numerous outlet modules available so just check the specs and make sure it offers everything you need. After you've ordered the module and received it in the mail, it’s time to go ahead with the install. Please note, this is a basic outline of how to install conference table power outlet boxes into a table top. Certain skill and experience is required with hand tools and power tools. If you are not comfortable modifying your furniture, contact someone who is. A general contractor or office furniture dealer may be able to make short work of this task. Mark where exactly on the table you want the outlet box installed with a pencil. This should be centered somewhere on the table and the rectangle you draw on your conference table should be the same dimensions as the base of the module that you are installing which doesn’t include the finishing edge that is found around the top of the connectivity box that will hide any cuts you make into the table. After you have everything marked out you can drill 4 holes into the table top where the 4 corners of your pencil marks. These holes should be made on the inside of the rectangle you have drawn and are simply there to allow you to put the blade of a jigsaw into the holes to start and finish your cuts. Place the blade of a jigsaw which is rated to cut the material your conference table is manufactured with, most likely a laminate surface which you can cut with a blade rated for wood. Begin cutting from one drill hole to the next, following the pencil marks you made on the table top. Do this for all 4 holes you drilled and remove the square piece that has been cut out. Check to see if your power outlet box fits into the square you have cut out. If not, check for any sections of your cut that are too small and slowly increase the size of the cut with your jig saw until the power module fits securely into the table top. That’s it! Your conference table should now be ready for power, data or other media such as connecting to a TV or charging devices by USB. If your table doesn’t have a hollow base to hide your cables in, it is pretty easy to install some cable wire management baskets on the bottom side of the table to keep your boardroom looking neat and clean. For all of your conference table needs we welcome you to browse the selection of conference tables on our site or at the Conference Table Company.